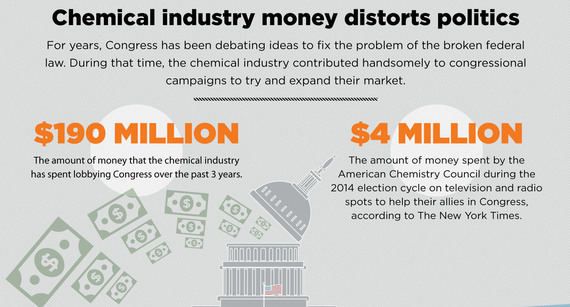 The Senate is poised to adopt a "chemical safety" bill (S. 697) that is fully supported by the chemical industry -- the same companies that have fought for decades against any restrictions on their toxic products. More than 450 environmental, consumer and health advocacy organizations oppose S. 697 and are calling for a stronger bill that provides real protections from dangerous chemicals that pollute our air, water and food and are found in hundreds of every day products. It is simply foolish to take the information provided by the sponsors of this industry-backed bill at face value. Note, for example, that the bill's supporters refer to the new authority it will give EPA to "review" chemicals -- while they ignore the bill's failure to provide for swift, strong EPA action to regulate toxic chemicals, with restrictions, phase-outs, and/or bans. Obviously, without stronger regulatory action when chemicals pose health threats, American children and families will remain at risk. Some other examples of the myths and facts around S. 697 follow. MYTH: S. 697 would immediately protect us from asbestos and other deadly chemicals with a "worst-first" approach. FACT: Under S. 697, companies can continue producing and selling asbestos for years while EPA is reviewing asbestos and dozens of other chemicals that have long been known to cause cancer and other serious illnesses. By contrast, rules in Europe have already led to restrictions on many toxic chemicals. Under S.697, EPA can only act when "substantial evidence" shows that chemicals pose an "unreasonable risk." This is exactly the kind of language that gives chemical industry legal wiggle room to block EPA action on asbestos, formaldehyde, arsenic and other harmful chemicals for years. MYTH: S. 697 will require the first-ever review of all chemicals on the market, and sets hard deadlines for EPA action. FACT: Under S. 697, EPA is required to begin reviews on only 25 chemicals in five years -- out of more than 80,000 that are currently in use. The agency would have at least seven years to complete each review, and has absolutely no deadlines for banning, restricting or regulating chemicals in any way. The bill actually makes it harder for EPA to regulate consumer products and to stop unsafe products that enter the U.S. from China or other countries. MYTH: S. 697 will ensure that safety evaluations of chemicals are only based on health and safety information, by eliminating cost-benefit analyses. FACT: Safety reviews are based on data, but for regulations, S. 697 actually requires a cost-benefit analysis before EPA can adopt any chemical ban or phase-out, if industry requests one. Industry will use these analyses as they do now -- to challenge, delay and derail regulations on their chemicals. MYTH: S. 697 insures that EPA will be adequately funded, with user fees of up to 25 percent of the funds allocated by Congress. 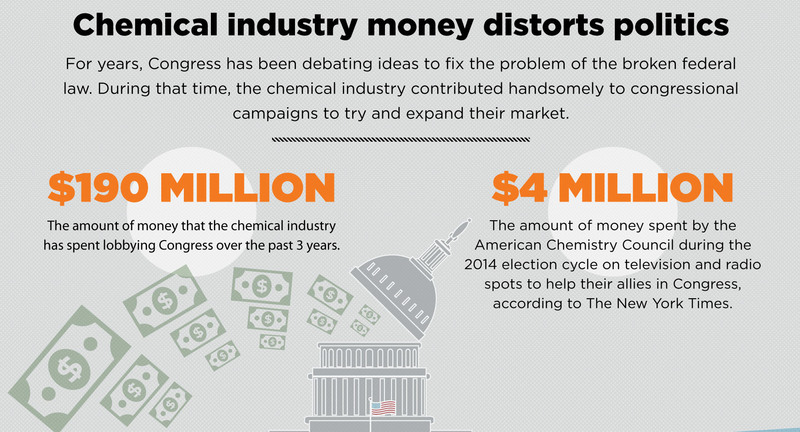 FACT: Since Congress has failed to fund EPA adequately for more than a decade, the agency is unlikely to have the resources needed even with fees from the chemical industry, which are capped at $18 million per year (from an industry with annual revenues of $5.2 trillion. MYTH: S. 697 does not pre-empt state chemical safety rules and protects California's Prop 65 law. FACT: Under S. 697, once EPA begins their "safety review" of the most toxic ("high priority") chemicals, states are barred from developing their own regulations - even if EPA takes decades to act. The bill also bars states from aiding EPA in enforcing federal rules, despite years of evidence showing that states play a critical role in protecting children and families from harmful chemicals. California could also be barred from using the latest science to update the state's Prop 65 list of cancer-causing chemicals and chemicals that cause serious reproductive harm. S.697 could cripple health protective action under Prop 65 and pre-empt other states from restricting chemicals that pose the worst health threats.